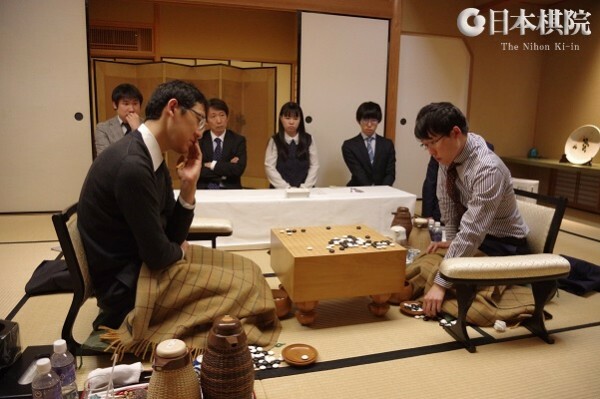 Iyama one win away from defending Kisei: The fifth game of the 41st Kisei title match was held at the Tokiwa Hotel in Kofu City, Yamanashi Prefecture, on March 1 and 2. Playing black, Iyama forced a resignation after 165 moves. That took his score to 3-2, so he is just one win away from defending his title. The game was marked by fierce fighting throughout, so it became a competition in reading. In the end, Iyama brought down a big white group. Incidentally, the game showed the increasing influence of the AI program Master in two places in the opening. Both of the moves in question were played by Iyama, but, although it didn’t come out in this game, Kono is also said to have been strongly influenced by AI go. The sixth game will be played on March 9 & 10. Fujisawa Rina makes good start in Women’s Meijin challenge: The first game of the 29th Women’s Meijin title match was played at the Arisu Pavilion at Heian Women’s University in Kyoto on March 1. Fujisawa Rina, the 18- year-old holder of the Women’s Honinbo title, is challenging Xie Yimin, holder of the other four women’s titles. Xie has dominated women’s go in Japan for a decade and has picked up 26 titles in the process (more than twice as many as any other woman player). Fujisawa has won just three titles so far, but she has established herself as the number two woman player. The two have met twice in titles match (the 2016and 2015 Women’s Honinbo) and won one each. The Heian Women’s University includes go as a regular subject in its curriculum. It has now hosted the first game of this match for six years in a row and has also appointed Xie as a Guest Professor. Fujisawa drew black in the nigiri. In the middle game, the game seemed to tilt a little in Xie’s favor, but Fujisawa fought back and took the lead, so Xie resigned after move 217. Since this match is a best-of-three, starting with a win is a big advantage. Xie already faces a kadoban. The second game will be played on March 8. (March 1) Yamashita Keigo 9P (W) beat Yuki Satoshi 9P by 5.5 points; Ko Iso 8P (W) beat Hane Naoki 9P by resig. This loss cost Hane his share of the lead. Motoki Katsuya 7P has the provisional lead on 4-1; Hane and Ko follow him on 4-2.